Are antidepressants accomplices to school shootings? Do you know that the perpetrators of some of the most notorious school shootings in the world were on antidepressants? No? I din’t think so. Most people don’t. It doesn’t get talked about very often. 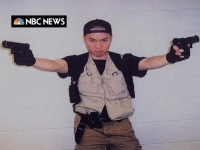 But in fact Cho Seung Hui, the shooter in the Virginia Tech massacre in Blacksburg, Virginia was on antidepressant medications. He killed thirty three people and wounded countless others, before taking his own life. Eric Harris, one of the shooters at Columbine High School, in Littleton, Colorado was on antidepressant medications at the time of his shooting rampage with fellow classmate, Dylan Klebold. Matti Juhani Saari, the shooter of ten at a Finnish College in Europe was on antidepressant medications at the time of his shooting spree when he later took his own life. Kip Kinkel, the fifteen year old shooter at Thurston High School in Springfield, Oregon, had been on anti-depressants in the weeks before his shooting spree that killed and injured nearly two dozen people. So, what is the connection between anti-depressants and shooting sprees? Could antidepressantmedications be “accomplices” in some of the worlds most senseless and horrifying school shoot sprees. What are the implications and what is being done? In Britain, researchers from Cardiff University have looked into the link between hostile and aggressive acts and antidepressant selective serotonin reuptake inhibitor (SSRI) medications. The research found that individuals on Paxil, and its generic paroxetine, have twice the risk for violent behavior, aggression and hostility than those not on SSRI antidepressant medications. Depression is bad – but is aggression any better? Currently, 1.5 million children are on antidepressant medications. In 2008, consumer advocates and parent’s right organizations called on Congress to explore the link between psychiatric medications, school shootings, and the harmful aggressive side effects of psychotropic medications. Advocates for reform are calling on Congress to mandate “black box” warnings to include mania, psychosis, hostility, hallucinations and homicidal behavior—to the current warnings regarding suicide. Above and beyond the link between psychiatric medications, primarily antidepressant medications and hostile and aggressive acts, is the ethical and medical question of the efficacy of antidepressant medications. Clearly, the side effects are devastating—horrendous. But, are the antidepressant medications effective? Survey says no. Two meta-analyses from the mother hens at the Food and Drug Administration and American Medical Association show that antidepressant medications for mild to moderate depression are little better than a placebo effect, and show questionable “clinical significance.” For individuals with severe depression, antidepressants are said to be slightly more effective. Studies show decreased responsiveness to the placebo effect among individual’s diagnosed with severe depression, rather than to increased responsiveness to SSRI antidepressant medication. Sounds like a big Pharma hoax 101; and the abhorrent part–the lives being lost at the hands of adolescents on antidepressants who involve themselves in killing sprees in schools. Indeed, we have an ethical dilemma on our hands—millions of people on lethal antidepressant medications—and its effects are tragically widespread.